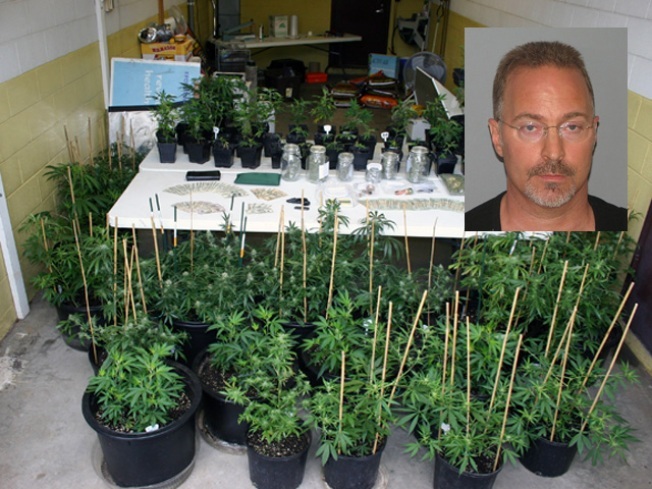 Police said Richard Luppino, 49, Berlin, was operating a marijuana growing operation out of his business. Inside Suburban Windows and Siding in Berlin, police said they found more than windows and siding. They found a marijuana factory and a quarter million dollars worth of marijuana, police said. On Friday, police arrested Richard Luppino, 49, Berlin, who has run the family business since 1986, according to the company Web site. The bust at the Farmington Avenue business came after what police said was a lengthy investigation that started with information from police in New Britain and West Hartford about the alleged illegal side business. Inside the windows and siding company, police found and seized 132 marijuana plants, several containers of dried, packaged marijuana, a handgun, hydroponic growing equipment and about $8,000 in cash, according to a news release from police. Police said the marijuana plants and the packaged pot have an estimated street value of $250,000. Luppino was charged with illegal cultivation of marijuana, possession of marijuana with intent to sell, operating a drug factory, possession of marijuana and possession of drug paraphernalia. He was released on a set bond of $150,000 and is scheduled to appear in the New Britain Superior Court on Thursday, Aug. 26. Police said they do not anticipate any additional arrests.